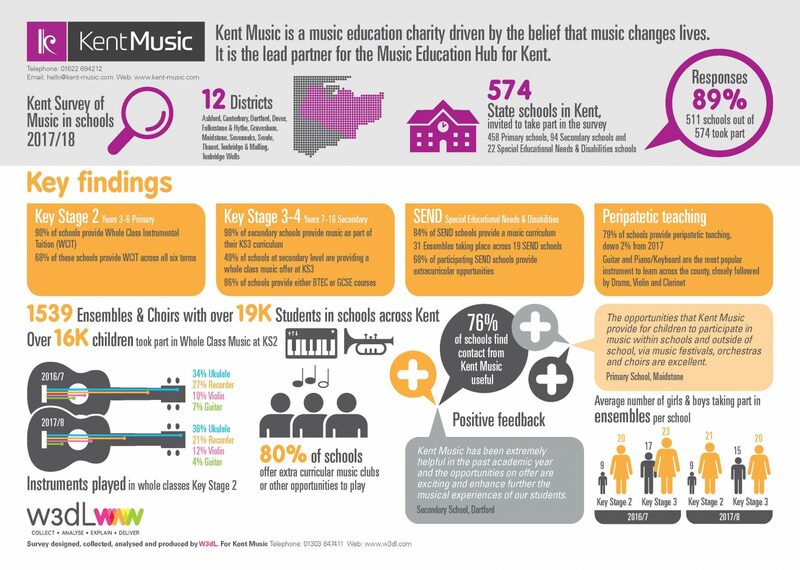 Kent Music co-ordinates and commissions music education programmes in and out of schools in Kent and is one of the 121 Music Education Hubs funded by Arts Council England on behalf of the Department for Education. As part of its funding agreement with Arts Council England (ACE), Kent Music is required to monitor the effectiveness of its programmes, and feedback its findings to ACE. To enable us to do this, since 2012, we have commissioned an external data company to work with us and help us undertake an online annual research study in Kent state schools. The purpose of this survey is to collect information about musical activities currently taking place at your school and the completion of this survey means that schools become eligible to receive ring-fenced music funding from Kent Music. Non completion of this survey will result in funding not being available or being withheld (see terms and conditions below). The data collected is collated and submitted to Arts Council England for each school as part of the Music Education Hub’s funding requirement from Arts Council England and the Department for Education. The data collected will also be used by Kent Music and our partners to inform planning for music education in Kent and to enhance our services, in line with data protection regulations. Contact details are not used for marketing purposes. The Annual Survey for the academic year 2018/19 will go out to schools on 20 May 2019 for submission of information about music in schools covering this academic year. This survey needs to be submitted by 21st June 2019 in order for funding to either commence or continue. All schools will receive an email containing a link to the survey. It can only be completed and submitted online. When finalised a reference PDF copy of the survey will be found here. Please do not submit this copy as your survey return – you can only complete and submit online via your personal link. Read more about the Music Education Hubs and the survey on the Arts Council England website. Thank you to all schools that completed their survey for the 2017-18 academic year. Thank you to all schools who completed their Survey for the 2017-18 academic year.